I have been meaning to write the 'Pattern' up for this blanket for a couple of months. It is a simple Granny stripe. 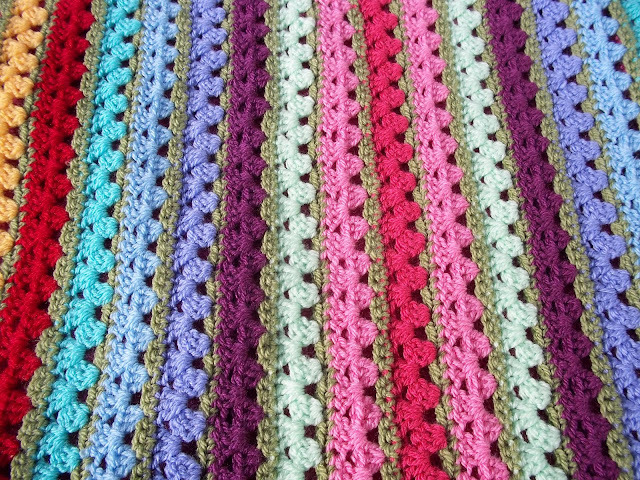 The stripes are alternating 'Granny' treble clusters and double crochet. (UK Crochet) The colour combinations are endless and very much down to personal preference. I have a 'thing' for pinks and sage green at the moment. 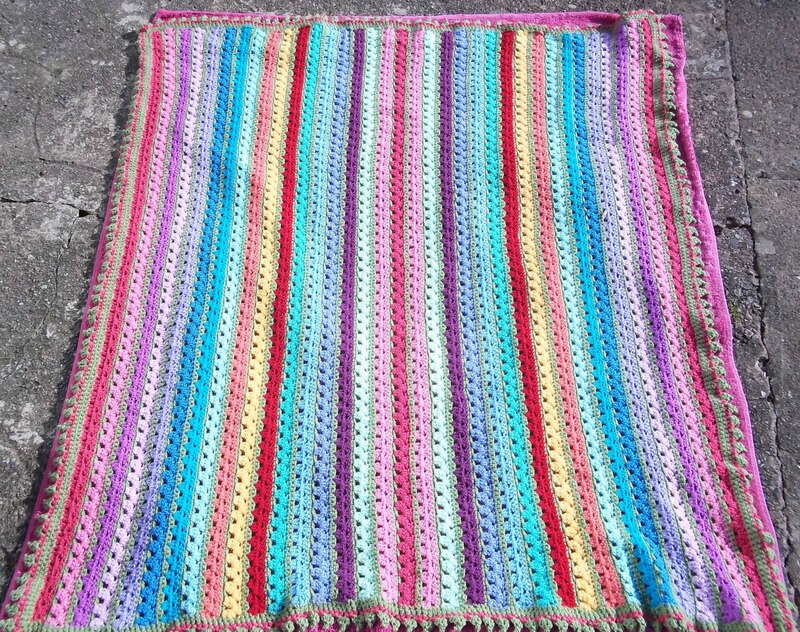 The main colour I used is called 'Meadow', Hence I named the blanket 'Meadowsweet'. I liked the effect of breaking the 'Granny Stripe' rows with a contrasting main colour in Double Crochet and as it is a three row pattern, the Double crochet row's appearance alternates in width. 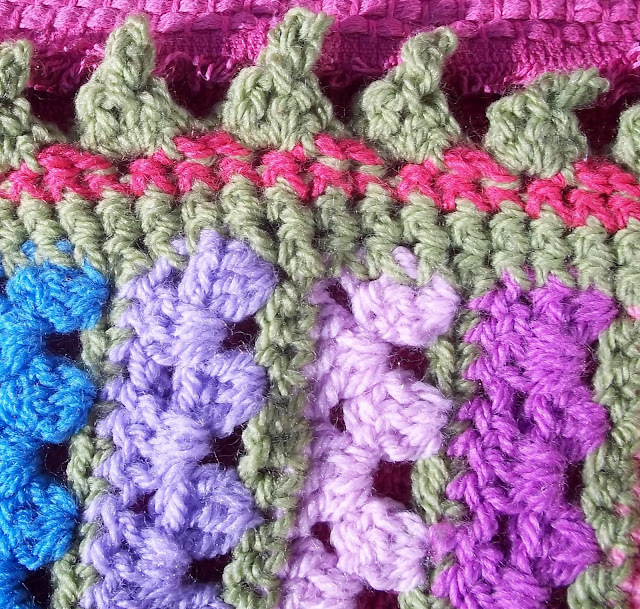 I edged the blanket with Double Crochet and 'Carnival Edging' it looks like rows of mini bunting. Once you have the basic blanket you could edge it in any number of ways. If you make any mistakes it is a very forgiving pattern and the edging evens out the finish. I used seventeen colours of Stylecraft DK purchased as a ‘Lucy Pack’. This makes a large Cot Blanket. Miss 2 chain and repeat 3 tr miss 2 chain to the end of the row. Turn and make 3 ch. 3 treble into every tr cluster space of the previous row, repeat to the end to form the second row. Third row choose your main colour (in this case Meadow Stylecraft DK ) and crochet 1 dc into each of the previous tc. This forms a solid row of double crochet. Fourth row change colour again and make 1 chain. Crochet 3 tr into the first dc of the previous row. Miss two stitches and repeat 3 tr in every 3rd dc. 3ch to turn. Fifth row: tr in each of the spaces between the tr clusters from the fourth row. Repeat these five rows changing colour to the main colour for a double crochet row after each two rows of treble clusters. Repeat striping for 37 pairs of treble cluster rows. Double Crochet around the entire blanket 3 times. At the corners use 1ch to turn the corner, 1dc, 1ch. For the ‘Carnival Edging’ Slip stitch into first stitch. Between the * and the * is the sequence, so repeat the ** instructions until you have finished the round! I also like a lot the way the mid row breaks the pattern. And I like your border! it makes me smile, is like a fair. I loved your asparagus recipe! I'll have to try it some time! thanks for your comments at my blog, I haven't been baking long, but I discovered that I'm good following instructions so if the recipe is well written I have a good result! I followed the link from Ravelry to find your blog, and I'm so glad I did! This blanket is absolutely lovely! I adore anything with grannies, but I really really like the look of the alternating rows, and the edging is marvelous. I'm going to have to hook this for my little one, thank you so much for sharing! i really like your knitting and crochet, i want to invite you in a big knitting project 26th-28th this August, in cannon hill park of birmingham, you can come with your knitting,spinning,weaving friend to run a workshop or show your fantastic knitting works in the park,if you are interested in, please contact me, we can disscuss more, my email is "niujilinblue@gmail.com"
I am putting American crochet terms in the pattern I'm going to print - am translating okay for most of it. I know that if you say treble, I do a double. And if you say a double, I so a single. A slip stitch and a chain remain the same. But if you say single crochet, what would that be in American terms? Thank you. Wow. the striping looks amazing. Hi -- I love this pattern, and I am wondering exactly how much yarn you used. I would like to do this with just a few less colors, however, I cannot tell how many skeins you utilized. I hope I can get it done for Christmas. Thank you in advance. I am newer at crochet and one of your lines of instructions confused me. "3 treble into every tr cluster space of the previous row, repeat to the end to form the second row." Do I treble cluster into each treble of that row or do I just do it once per cluster? If I do it once per cluster, where do I put my hook to begin that? Thanks! New Year and a New Day Out! Loving this "v" stitch blanket. Mimi's Mommy - It's all about Mimi and his Mommy! 8! That’s great! Happy Birthday Mimi!!! Something very different, personal and yet public! Daily Baby - A surprise! Ta - dah! Crochet sock Result! Inthesky71. Simple theme. Powered by Blogger.